LAS VEGAS NASCAR fans will be cool and comfortable when they attend the South Point 400 weekend at Las Vegas Motor Speedway. As part of its KeepinÂ’ It Cool initiative, the speedway is underscoring its expanded cooling plans that call for misting stations, cooling zones, shaded areas and ways for fans to stay cool and hydrated throughout the weekend. In addition to extra water sales locations, LVMS is adding water bubblers that will allow fans to get free cups of cool water at a number of stations around the property. The speedway will have 100 misting machines set up at various locations, as well as large shade tents in the Neon Garage, the Vegas Village in Turn 4 and in the Fan Engagement Area. Extra-large port-a-cool fans will be used to circulate air through the concourse underneath the grandstands, and the Dream Racing Gaming Garage in the infield will be set up as a cool zone as well. 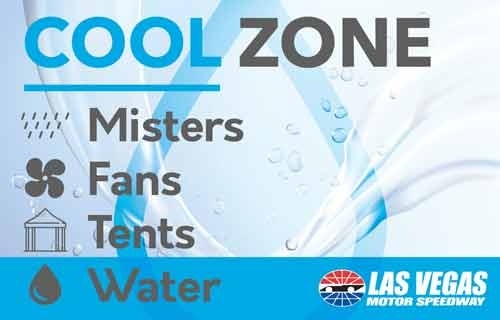 Fans also can purchase towels that will be dipped in ice water at the LVMS merchandise areas, and several vendors in the Fan Engagement Area also will be selling cooling supplies. WeÂ’re poised for a wonderful week of racing at LVMS, and we want to make sure our fans have a great time, LVMS President Chris Powell said. Fan comfort is one of our chief concerns at any event, and weÂ’re taking measures to keep everyone cool and hydrated at our races next month. We want everyone to leave with great memories from their experience at LVMS, and weÂ’re looking forward to kicking off the Monster Energy NASCAR Cup Series playoffs with a bang. The speedway also is expanding its number of roving paramedic teams, first aid stations and medical personnel in the Neon Garage and grandstands. As is always the case during major-event weekends, fans can reach LVMS Fan Assistance at 702-632-8006. Coolers are not allowed at LVMS, but each patron is allowed to bring one snack and one non-alcoholic beverage into the gates in bags that measure no larger than 18x18x6 in size. LVMSÂ’s South Point 400 weekend begins with the Star Nursery 100 NASCAR K&N Series West race at the Dirt Track on Thursday, Sept. 13, before moving to the superspeedway for three consecutive days. The World of Westgate 200 Camping World Truck Series race is set for Friday, with the DC Solar 300 NASCAR Xfinity Series event following on Saturday and the South Point 400 MENCS playoff kickoff capping the weekendÂ’s racing on Sunday. Tickets for the South Point 400 weekend are available at www.LVMS.com or by calling 1-800-644-4444.